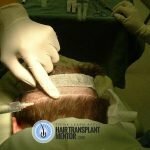 Scared of Hair Transplants? The truth about strip surgery. There are a two primary methods of surgical hair restoration currently available today. They are strip hair transplant surgery (FUT or FUSS) and follicular unit hair transplant surgery (FUE). Each has their own distinct advantages and disadvantages. Strip Surgery - This is the most prevalent form of surgical hair restoration, sometimes referred to as "FUT" surgery. If you refer to the section Hair Transplant Terms & Definitions you will understand why I say the term "FUT" is a double entendre and that the term FUSS should be the standard reference to strip surgery. Strip surgery is getting more and more of a bad reputation and there are two reasons for this. 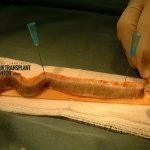 The first reason is because there is an unpredictable element that goes above and beyond the question of "will the transplant grow" and it involves the chances of the donor scar widening as it heals.This is a very real possibility and something that patients should be completely clear about when they are considering strip surgery. With the number of resources available online it is getting more obvious to patients that the donor scar is a potential issue if they opt for this procedure. The second reason why strip surgery is getting a bad reputation is because the procedure is getting absolutely hammered by every single FUE only clinic in existence. It is in the marketing material and it is dripping from the mouths of the consultants and/or doctors. It is the easy sell and it is exactly what I would do if I were working for an FUE only clinic. Show a picture of a bad strip scar and you just cemented the deal. Done. Strip surgery is exactly what it sounds like. 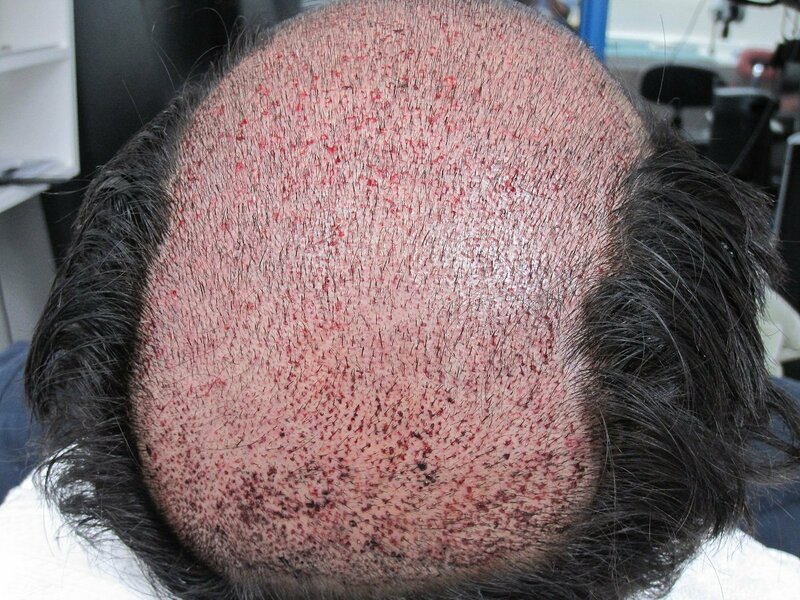 It is when a doctor takes a strip of skin from your head to harvest hair for transplant purposes. It sounds and looks worse than it really is and it is not only a very reliable procedure it is also the best way to get to the sweet spot of your donor zone. Strip surgery is also the procedure to choose if you need or want to get the maximum number of follicular units in one day. When I say the "sweet spot" of your donor zone I'm talking about the area of the safe donor zone that has the highest density and the best quality and caliber hair. You can see it on most bald guys out there. If they have a horseshoe of hair around the back and sides of their scalp there is an area of higher density that usually runs through this horseshoe where the hair looks a bit thicker and a bit healthier than the surrounding hair. The tension of the target donor strip along the entire length of the incision. 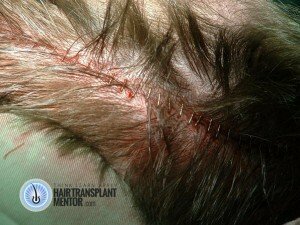 There are several layers of tissue in the donor scalp and the tension that this tissue is subject to varies along the path of the incision. When the doctor is using his scalpel he should stop every few centimeters and take note of where the tension increases and decreases. This allows the surgeon to adjust the width of the donor strip accordingly. The more tension there is one area the more narrow the incision becomes and the more laxity that is present the wider the strip can become. The point is to manage the tension to the point that no single area has a quantifiable degree of additional tension during the final wound closure than any other area of the donor strip. There are two areas of the donor zone that surgeons should pay particular attention to and these are called the mastoid processes. If you imagine your skull being in the shape of a box the mastoid processes would be on the lower back two corners. These areas historically have higher levels of tension than other areas of the donor zone thus careful attention must be paid to avoid removing too much tissue. Even when great care is taken and a narrow donor scar is the result shock loss will be a common occurrence due to the interruption of blood flow. Small patches of no growth will form and last for three or four months in many cases. Donor zone transection. Great care must be taken in order to avoid transecting follicular bundles during strip surgery both in the donor strip and in the peripheral of the donor incision. If too many follicular bundles are transected this can lead to a permanent reduction in density and permanent shock loss. The ideal way to avoid transection is through the use of tumescence and by pushing a single blade scalpel along the target incision line as opposed to pulling. Tumescence of the donor zone creates large paths in between the follicular units making it easier to avoid transection and when the scalpel is pushed along these paths there is a clear field of view that reduces the chances of transection dramatically. So what is it that doctors look at when they are assessing the candidacy of a strip surgery patient? Obviously they are first looking at the supply and demand of the situation that the patient presents. 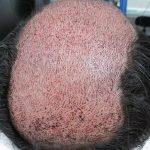 What is the area of hair loss and the patient's expectations for a result and does the patient have the donor reserves to meet these expectations with one or multiple surgeries? The physician should also be assessing if the expectations of the patient are realistic and if they are considering the potential downsides of the procedure. 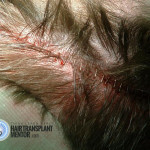 Once this is considered the doctor will assess the potential for the procedure by gauging the laxity of the donor scalp. The doctor should be assessing the posterior donor zone as well as the lateral donor zones (above the ears). There have been attempts to create a standardized laxity test but in my opinion simple experience will tell the doctor (or consultant) what size surgery will be possible. In addition to laxity the doctor should also be assessing donor density as well as, to a lesser degree, the type of hair being transplanted. It is coarse? Is it fine? Wavy? Curly? Straight. All of these factors work together to determine the potential for success or failure. Assuming you wind up having surgery there are two possible ways that the surgery will move forward. Once you are in the clinic and you are prepped you will either be laying face down on table that is similar to a massage table with an opening for your face or you will be sitting up in a chair similar to a dentist chair. When one is laying prone or face down the doctor will have the patient tuck their chin in or "down" as this helps to expose the target donor zone. 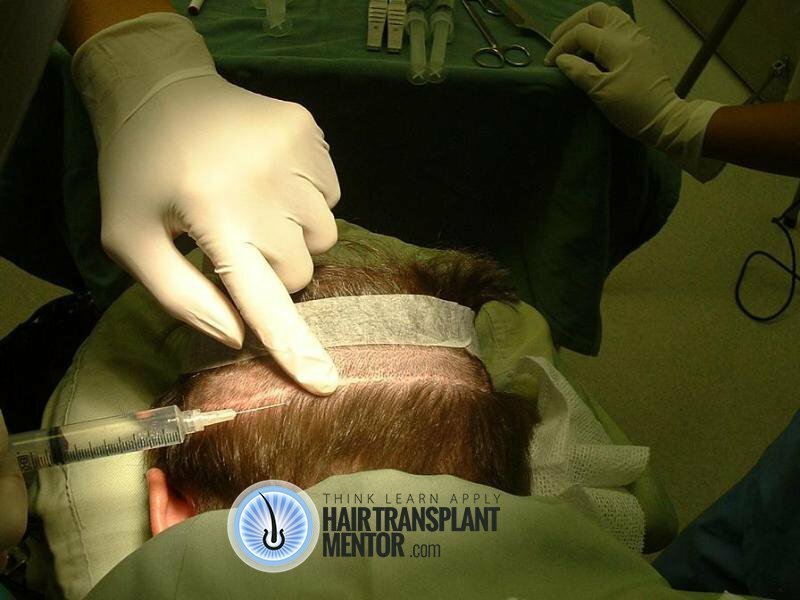 Furthermore, at this angle the doctor can easily position the scalpel so that as he is pushing the scalpel though the donor zone he can maintain the angle of the scalpel at the same angle of hair growth as it exits the scalp. This helps to greatly reduce transection and allows for a cleaner cut. it is also easier to prevent excess bleeding as any bleeding that does occur will "pool" in the donor wound giving the assisting technician time to absorb the blood with a dabbing gauze. Many doctors prefer when patient's sit up in the chair as they feel it is more comfortable for the patient, which is true, but in my opinion the benefits cease there. Donor wound closure using surgical staples. Strip surgery donor wound closure occurs in various ways. Some doctors will close the wound in sections as individual segments of the strip are removed. The wound will be closed before the next section is removed until the entire strip is removed and the wound is closed shortly thereafter. This is thought to be helpful as the longer the wound stays open the more difficult it is to close. Others will close the entire wound at once and others will close half of the wound before they move on the the second half. The two closure techniques are sutures and staples with a combination of the two also often used. When they are combined sutures are used for the deeper layers of the wound as it is thought that this helps to reduce the tension placed on the superficially placed staples. Donor strip being prepped for slivering and dissection. 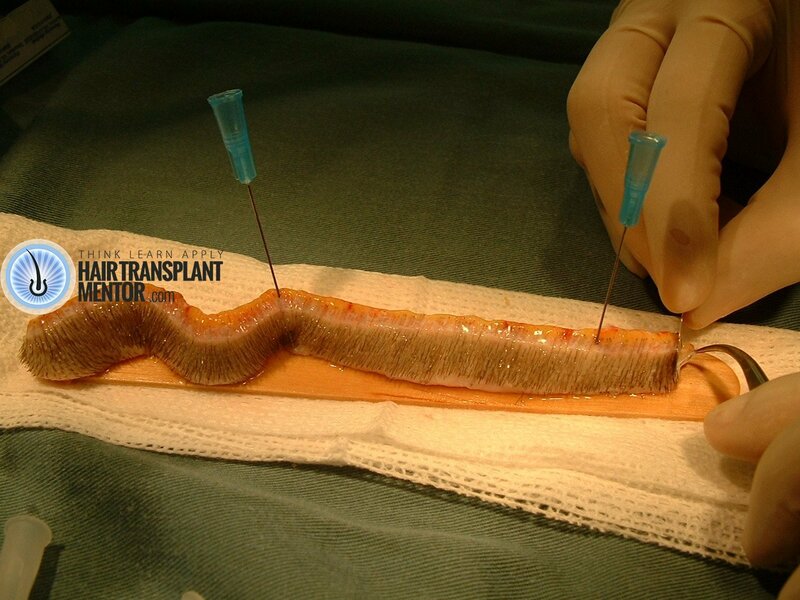 Once the donor wound is closed the donor strip is already being addressed by the technicians assigned to the case. Depending on the size of the surgery and the number of technicians working, one or more technicians will be tasked with "slivering" the donor strip. This is the process of sectioning off narrow pieces of tissue that are so thin they are nearly transparent but they contain numerous follicular units. All slivering is performed under stereoscopic microscopes. These slivers are then handed off to the remaining technicians where they further refine the tissue down to the basic follicular units. They are then categorized and labeled as singles, doubles, triples, quads, etc. During this time the doctor is coordinating with the technicians to get an idea of how many grafts of each size are being dissected and this is where the recipient site incision making will begin. The doctor will make the incisions in the recipient zone then take a break to allow the technicians to begin placing the grafts. This "staggered" approach is fairly common but is only necessary for larger procedures. This part of the process is not the same for all clinics especially those that use the stick and place method but for the most part this is what one can expect during strip surgery. Once the placement is complete the patient is usually given a take home package with prescription painkillers and antibiotics. A megasession of over 5000 grafts. To harvest this many grafts via FUE would take two or three days. In most cases a higher average yield or growth rate. Lower overall cost on average usually in the range of 3.00 to 5.00 per graft. More grafts available in one sitting, ranging from 1000 grafts to 5000 grafts depending on the need and the experience of the clinic. Potentially shorter time to final result due to larger average size sessions. Even "excellent " donor scars such as this one are visible with a shaved head. This should be discussed with the doctor before any strip surgery is to be considered. Potential for wide donor scarring that necessitates follow up repair surgery. 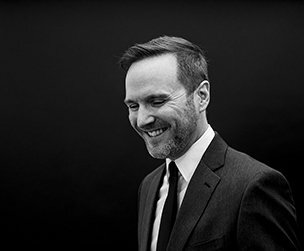 Loss of hairstyles that are considered “short” or “very short” due to presence of even “good” donor scars. Potential for long term or permanent nerve damage in the donor zone. Numbness will persist in the donor zone for several months due to the time it takes for severed nerve endings to reconnect. Permanent numbness is rare with better clinics but it is not unheard of. Restrictions on head and neck movement for the first couple of weeks accompanied by more strict guidelines against heavy gym workouts. The goal is to prevent additional tension on the donor zone from external factors. There can be arguments made for additional disadvantages with strip surgery but the issues listed above are the primary concerns patients should be aware of.